Prolific Burglar Arrested, LIVINGSTON, October 4, 2014 - At approximately 5:36 pm on September 11, 2014, the Polk County Sheriff’s Office received a call in reference to a burglary of a habitation in the Forest Springs subdivision located off Highway 146 South, eight miles south of Livingston. A deputy arrived on scene to find the home had been broken into and several coin collections, guns, and antique collector baseball cards had been stolen. Information gathered from the homeowner lead to suspects that may have been involved in the burglary. 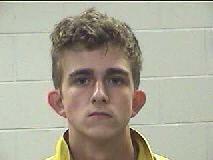 Detective David Mitchell with the Polk County Sheriff’s Office located and interviewed Elijah Dabney III. Dabney admitted to the burglary. All of the stolen property was recovered and returned to the homeowner. If anyone suspects a theft or a burglary that may have been committed by this individual. Contact Detective David Mitchell at the Polk County Sheriff’s Office at (936) 329-9027.